SOUTHAMPTON, N.Y. (AP) Shinnecock Hills is no longer the only challenge at this U.S. Open. ”You’ve got to play really good golf if you want to shoot a good score, and I like where par is a good score on every hole, no matter what club you’ve got in your hand, what hole it is,” Johnson said. Only six other players in the U.S. Open have led by as many as four shots after 36 holes. All but one – Tom McNamara in 1909 – went on to win. Even so, there’s plenty of reminders of how it can all go wrong – some of them from Johnson’s own experiences, most of them from the final few hours Friday afternoon in perfect weather from those trying to catch him. ”There’s a disaster on every single hole,” Ian Poulter said moments after he went through one. Poulter was one shot out of the lead and in the middle of the fairway with two holes to go when one bad shot led to a few more that were just as worse – a bunker shot that sailed over the green, a chunked chip into the hay, a chop short of the green and a triple bogey on No. 8. He made bogey on his last hole for a 72. Poulter didn’t lose sight of being in a tie for fourth, five shots out of the lead. Tiger Woods won’t be around to see how it unfolds, and plenty of star power joined him on the way out of town. Jordan Spieth joined them in the most unlikely fashion. He took three shots to get up the slope and onto the 10th green, making double bogey. 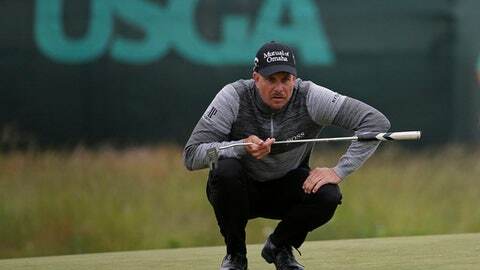 He was three shots over the cut line with six holes to play when he ran off four straight birdies to get inside the number – only to three-putt for bogey on the 17th, stub a chip from the collar of a bunker on the 18th and miss the par putt for a 71. He had not missed the cut in a major since the 2014 PGA Championship. Piercy, a runner-up to Johnson at Oakmont two years ago, had a 71 and will play in the final group with him Saturday. Piercy’s day was not without regrets, especially when he three-putted from 4 feet for bogey on the par-5 16th. Rose also was under par until closing with successive bogeys. With 36 holes to play, he wasn’t overly concerned about tracking down the No. 1 player in the world. ”I never want to make doubles,” Johnson said. ”Around here, it seems like when I do get out of position, I’m just trying to do everything I can to get it back into position, not try to push it, and just give myself a decent look … something on the green where I can have a look at par.